When compared to popular RTS and FPS games of the last 20 years, BioWare maintains that The Old Republic brought something new to its genre. One month ago in a galaxy right here, BioWare's anticipated online RPG Star Wars: The Old Republic launched to good reviews and excellent sales. While few people take issue with the game's high production values or immersive storytelling, one frequent criticism is that TOR is, in terms of gameplay, not substantially different from the rest of the MMO market. Now that the dust from the game's first few weeks has settled, BioWare has taken an opportunity to weigh in on the game's reception. While the company admits that its game will not redefine MMO gameplay, it maintains that TOR is at least as innovative as most games in the RTS or FPS markets - if not more so. "[If] you look at a Battlefield or a Call of Duty or a Gears of War or even a Half-Life - those games use the same tried and true interface and the same tried and true game mechanics of the first-person shooter genre that's been around for 20 years," says James Ohlen, the game's director. "[RTS] games kept the same tried and true interface and the same tried and true mechanics that existed for 20 years." According to Ohlen, TOR is evolutionary rather than revolutionary, focusing on how to make the genre incrementally better rather than drastically different. "[We] wanted to take the lessons that have been developed in that genre over years and years and years and basically refine them, much like other companies do with other genres." In particular, Ohlen defended the game's deep narrative developments. 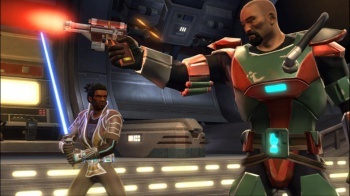 "We were building essentially a classic MMO with BioWare storytelling set in the Star Wars universe," he explains. "And there were a lot of people out there who wanted us to reinvent the universe and come up with a game system that had never been done before. And that was something we weren't doing." According to Ohlen, BioWare did not want to drive existing MMO fans away, so purposely kept much of the gameplay that would be familiar to them. With over 1 million users in the first week, TOR is one of the fastest-growing MMOs in history. Now, BioWare's challenge will be to keep the momentum going. Regarding some of the very vocal negativity in regard to the game, Ohlen remarks, "We're a big target ... But that's just the nature of the game. If you're going to build a huge game and try to go out to a lot of people, you're going to have people who just react poorly." No arguments here.